Milwaukee Corporate Strategies Attorneys - Wagner Law Group, S.C.
Due to the hard work of corporate management and solid effort by employees, a publicly held company sometimes creates a level of inherent value that is not yet reflected in the price of the company’s shares on the open market. In such situations, the company can become the target of outsiders who seek to gain control before the stock’s inevitable rise in price. Often, the acquiring group or corporation desires control of the target company because of the strength of the target’s management. If that management is given an incentive to leave after the takeover, a corporate raider may well give second thoughts to the raid itself. The employment agreements of top management can be altered so as to provide “golden parachutes”— or lucrative payments for change in the overall composition of the target company’s board of directors. Hefty severance allowances for important key employees can also make it much more expensive for the corporate raider to gain ultimate control over the target. An employee stock option plan, or ESOP, is a special IRS-qualified retirement plan offering tax savings to both the corporation and its shareholders. Through an ESOP, a broad group of employees are given an ownership stake in the company. Those employees ordinarily vote in conjunction with the target’s management. In most cases, many of them are the target’s management. Should the takeover attempt require shareholder approval, the target has stacked the deck a bit through the establishment of the ESOP. Sometimes referred to as “Shark Repellents,” these clauses can be inserted in important corporate agreements, such as bank loan agreements, equipment leasing arrangements, and the like. These give the lender or lessor rights to accelerate the loan or terminate the lease arrangement if control of the company passes to an outsider. While these clauses can prompt litigation, they can be quite effective in holding off the advances of an unwanted and hostile suitor. While the terms of such arrangements vary and are typically quite complex, a “poison pill” is typically some form of charter provision that allows existing shareholders, but not the corporate raider, the right to purchase the target company’s stock at a price considerably below its market value. Allowing existing shareholders these rights dilutes the shares held by the raider, making the takeover much more expensive and, therefore, less attractive. Somewhat similar to golden parachutes, noted above, with “people pills,” management and other key personnel threaten to resign en masse. The acquiring group or corporation often wants the target intact. This mechanism threatens the future of the target to maintain its track record of success. 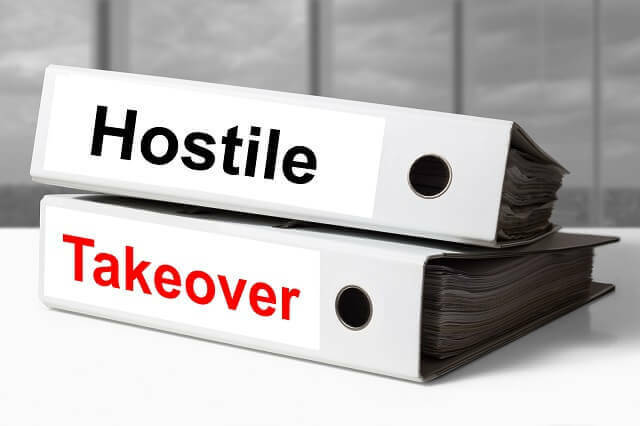 Corporate management should always be diligent in protecting the company from the sort of hostile takeovers that can erode and degrade years of hard work contributed by many. The best tools and mechanisms to be used in the defense of a company vary from company to company and also change over time. Companies need solid, experienced legal counsel, like the Milwaukee-based Kerkman Wagner & Dunn, at the center of any discussion and planning. To begin a review of your company’s special needs, call 414–278–7000, or complete the contact form on our firm’s web site. The initial consult is free of charge.